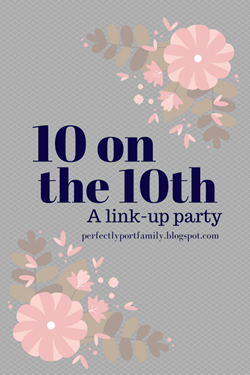 This month’s topic for 10 on the 10th with Perfectly Port is 10 Daily Habits. Habits are interesting. You can have good habits, bad habits, habits you think you should have but don’t, habits you wish you didn’t do, or things that have become habits out of routine. In this post I will share some of all of the above, or a typical day in my normal life, and I hope you learn a bit more about me in the process. 1. I start the day off with a quick check to my phone and hope there is nothing that I need to immediately look at! Then I start my coffee, get breakfast for the kids, and make my own breakfast. I eat and drink my coffee while I check my emails and start reading blog posts. 2. We’re on a different schedule during school, but right now Simon has camp starting at 9, so I bring him there and then do any morning errands I need to take care of. I prefer to take care of everything on the same trip rather than going home and back out again! 3. I exercise. Right now I’m using Beachbody On Demand and because Gabbie is at home I want to do it in the privacy of my room, so I stream it on my phone. I started the Core de Force program because I’ve always liked kickboxing and it seems challenging enough. I gained weight on my trip and I need to lose it again! 4. Next, I shower. So if you’re keeping track, I’ve already gone out and done errands, come home, worked out, and now I’m showering. I would love to say my post-shower beauty habits include putting on makeup, but most days I don’t find that worthwhile! At the moment though, I am doing the Revitalist Challenge through Influesnster, which means applying L’Oreal’s Triple Power Deep Acting Moisturizer Cream twice a day, so that’s a habit I need to remember to do! 5. After I shower I do household chores such as laundry. I don’t do a load every day, but when I do, I do it after my workout so I can include whatever I wore to exercise and get that clean as well. 6. Time for lunch. Gabbie wanted her usual pizza bagel, which takes 10 minutes to cook. While it was cooking I made my own lunch, which habitually is a salad including lettuce, olives, chick peas, avocado, and feta cheese, plus olive oil and vinegar. Fun fact – I love red wine vinegar and it is not so easy to find it marked kosher. In NJ, the store brand is kosher so I bought a bunch to bring home and now I don’t have to worry about it for awhile! 7. While I eat my lunch, I generally watch a TV show. I call it my lunch break. This time I was finishing up with Pretty Little Liars. I usually add a row to my crochet blanket after I eat and while I’m still watching the show, but since I only had half an hour to go, I didn’t have the time. After lunch I wash all of the dishes from breakfast and lunch. On this day I also finished the laundry and put it away. 8. Throughout the afternoon I work on my blog and read everyone else’s blogs. Depending how much I need to do, I sometimes have time for more TV shows – but this is actually a habit I want to break! I also get the mail mid-afternoon. I got a letter from Zachary at camp (It says “Dear Mommy, We are going roller skating and bowling.”) and our Sing DVD that the kids left at my in-laws’ house. 9. Simon finishes camp at 3 right now. During the school year I have a longer time before the kids get home and when they do, I help them with homework and make their lunches for the following day. It is so nice that Simon’s camp gives lunch so I don’t need to send him any! My afternoon habits are much more relaxed during the summer time. On this day we worked on Simon’s Knex. The box says age 7 and up but it was hard for me! And…I’m still working on my blog! 10. My evening habits include a nightly walk – we started walking a mile a day back in May and continue to do so most evenings! The boys will usually ride their bikes while Dave and I walk. And I read before bed. A lot of people ask me how I read so much. Well, it’s just a habit! One thing I really need to adopt in my life is better tooth health habits. Many of you were curious when I said I don’t actually use an electric toothbrush, but rather a battery operated one. According to my dentist, the electric ones provide more vibration and are therefore better. Then again, the dentist sells toothbrushes and I’m sure they want me to buy the one they are selling! The reason I don’t use a toothbrush with a lot of vibration is because I don’t like how it feels. And my dentist says I have too much plaque and my gums aren’t healthy so I need to do better. In any case, tooth health includes regular tooth brushing and I was recently given the chance to sample Himalaya Botanique Toothpaste – a toothpaste that approaches oral care differently. product for free from Moms Meet to use and post my honest opinions. pineapple to help remove surface stains. toothpaste. All are Carrageenan, Fluoride and SLS free as well as gluten-free. I tested the Whitening Complete Care Simply Mint toothpaste and the texture and taste were both pleasant. My teeth feel clean after using the toothpaste. I would be happy if my teeth would become whiter by using this toothpaste! My only concern is that the all-natural ingredients don’t include fluoride and I am not sure if I should remove fluoride from my tooth routine. Also, I wonder how the results would show over time. Would my dentist be happy with my teeth for once? If anyone is curious about this brand, their website offers free samples, or you can get 25% off on Amazon with the code SVOTH9OW. Himalaya Botanique Toothpaste is also available at Whole Foods, Sprouts, Natural Grocers, and Vitamin Cottage as well as regional health food stores including PCC Natural Markets, Central Market, Mother’s Market, Earth Origins, King Soopers, etc. What are some of your daily habits?